Delaware offers postsecondary vocational and trade education programs through its community college system, technical schools, and its public universities. Some of the brightest career opportunities for graduates of these career and technical programs reside in the fields of agriscience, health science, transportation and human services. Read on to learn more about vocational programs in the state of Delaware, and the growing career opportunities available to graduates. Students looking for vocational and trade school options have several to choose from in Delaware. Delaware offers career and vocational training at various trade schools, community colleges and career colleges where students can study in-demand subjects such as construction, trade specialties and allied health. Delaware students will find our rankings of accredited schools helpful, as we look at criteria such as student to teacher ratio and number of programs offered. Delaware Technical Community College first opened its doors in 1967. Two year vocational programs of study at the college are in agriculture, culinary arts and transportation. Campuses where the classes are taught are Georgetown, Dover, Stanton and Wilmington. Applications are accepted from new and returning students, transferring students, veterans, active duty military members and students from other countries. Tutoring is offered in group settings and on an individual basis for students who participate in the school's Parallel Program. This additional academic support is provided by graduates, current students, professionals and volunteers. Child development centers are located on each of the college's campuses. At the Stanton and Wilmington campuses of Delaware Technical Community College, students will have the opportunity to choose between a degree that will either lead them onto further education, or directly into the workforce. With one of these vocational programs, students will attend classes that implement hands-on lesson plans administered by teachers with years of industry-specific experience. Students who wish to transfer to a 4-year institution after the completion of their DTCC degree will find that many of their classes will be honored throughout the United States. DTCC has four campuses throughout Delaware, allowing students to take classes at the location nearest to their home. At Delaware Technical Community College’s Terry campus, students can choose from a long list of vocational and transferable degree programs, guaranteeing they find the best path to achieve their career goals. Degree levels vary between certificate programs, associate’s programs, and diploma programs, all of which are fully accredited by the Middle States Commission on Higher Education. Students transferring from another institution may be able to receive credit for previously completed courses, and if not, then students also have the option to complete a competency exam to earn course credit. Various vocational and technical schools are available for prospective students in Delaware, offering a number of programs. These schools include community colleges and technical schools as well as public universities in the state. Use the search tool below to find a program and school near you. According to the U.S. Department of Education, 9,955 students are enrolled in postsecondary career and technical programs in Delaware. Certain careers such as chemical technician and paralegal in the state of Delaware earn higher than average annual salaries compared to the national average. Secondary career and technical education is offered through comprehensive high schools, comprehensive charter high schools, and technical high schools. Connected Degree, a web-based degree tool, allows Delaware Community and Technical College students to track how their associate degree credits will apply toward a bachelor’s degree at participating institutions. There are several trade schools and community colleges offering subbaccalaureate—below a bachelor’s degree—certificates and diplomas. Some of the most popular programs include business administration and accounting, as well as programs in the healthcare industry such as nursing assistants and medical insurance specialists. In Delaware, most students choose the pursue vocational education at the associate’s degree level. Some of the fastest growing careers in the state of Delaware can be pursued with vocational or technical training. There is high demand for home health aides, registered nurses, medical assistants, and dental assistants—all of which are jobs available to applicants with less than a bachelor’s degree. As you can see in the chart below, the median annual wage in Delaware is higher than the national average for several careers requiring only some postsecondary education. 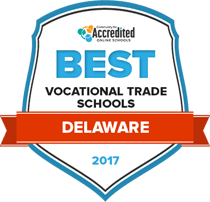 As the largest city in the state of Delaware, Wilmington is home to four trade schools offering vocational and trade certificate and diploma programs. For example, the Dawn Career Institute is a small, accredited school of less than 250 students offering programs within the fields of health, legal, fitness, and personal and culinary services. For those interested in a career in graphic design or interactive technology, the Delaware College of Art and Design offers several programs focused on these skills. The Harris School of Business offers several health science programs including dental assisting, massage therapy, and medical administrative assisting. With over 6,500 students, Delaware Technical Community College is the largest of the four schools offering vocational and trade programs in Wilmington. Associate degree programs are most common at this campus, but students can earn certificates in programs related to entrepreneurial studies, English language, and home health aide training. Wilmington is home to key employers in the state such as the New Castle County seat, Christiana Care Health System and DuPont. It also houses the headquarters of several banking and credit card companies. Additionally, the State of Delaware employs several thousand people. Many of the jobs produced by these businesses are a natural fit for the common vocational certificates available within the state of Delaware. The DHA assists healthcare professionals by providing information related to healthcare jobs and scholarships as well as professional resources. The Delaware Nurse Association offers its members information about job opportunities, continuing education, and advocacy. DPA is a comprehensive resource for paralegals with a network of employment, educational and pro bono opportunities available in the state of Delaware. DYOI provides resources for young people leaving the foster care systems and transitioning to independent adult living. The offer information related to various resources, including educational and vocational programs. The Department of Education offers information for students and parents of students as they prepare for graduation and begin considering higher education opportunities. This includes information related to tests, financial aid, and more.